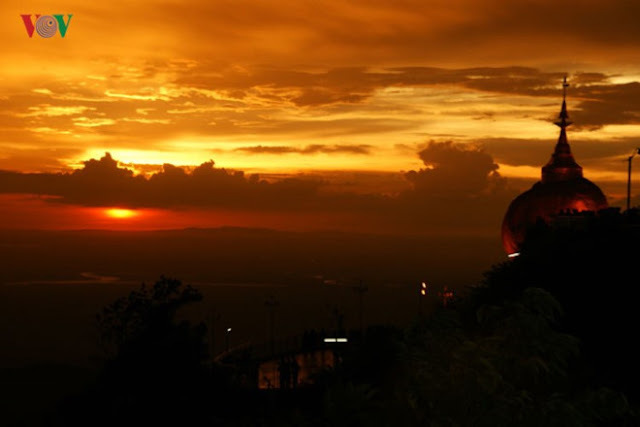 Vietnam Travel Blog » Vietnam Destinations » Travel News » What Do You Know About Kyaikhtiyo – The Golden Rock Pagoda? What Do You Know About Kyaikhtiyo – The Golden Rock Pagoda? The Golden Rock Pagoda or Kyaikhtiyo Pagoda is one of the oldest and most famous pagodas in Myanmar, and is one of the world's cultural heritages. The Golden Rock Pagoda (Kyaikhtiyo Pagoda) is one of Myanmar's most famous monuments and is one of the few masterpieces of nature. The pagoda is located on the top of Kyaikhtiyo Mountain, 1,000 meters above sea level and more than 200 kilometers from Yangon. 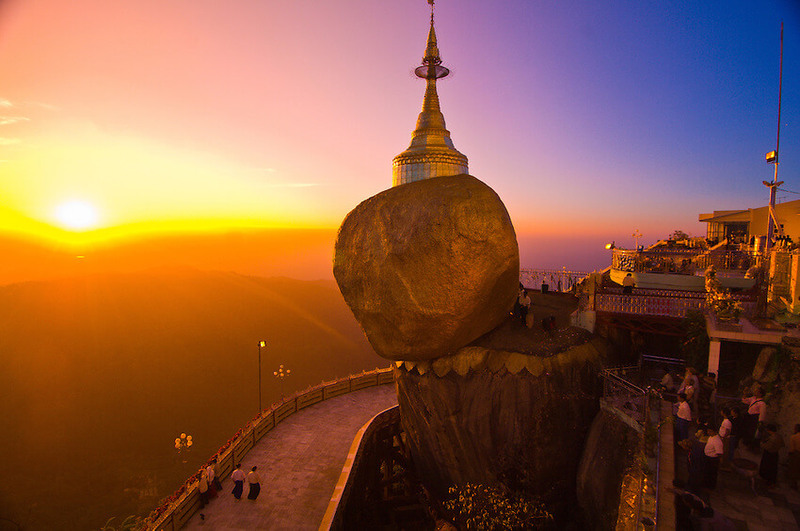 Kyaikhtiyo Pagoda is located on an egg-shaped rock lying on the slopes of the same name. Many believe that the pagoda was built during the Buddha's lifetime, over 2,500 years ago. Attached to the golden rock is an interesting and mysterious legend of the Buddha's coming here. Therefore, there are always a lot of people come here visiting, praying and worshiping. One particular thing is that the contact surface between the rock and the ground is only 78 cm². Kyaikhtiyo Pagoda (Golden Rock Pagoda) with many statues placed around the corner, especially some Buddha statues are inlaid with thousands of gemstones, several hundred diamonds with hundreds of gold bell. When night falls, the temple glows yellow, shimmer in the smoke of incense together with prayers. At any point during the day, Golden Rock Pagoda also has its own mysterious beauty. 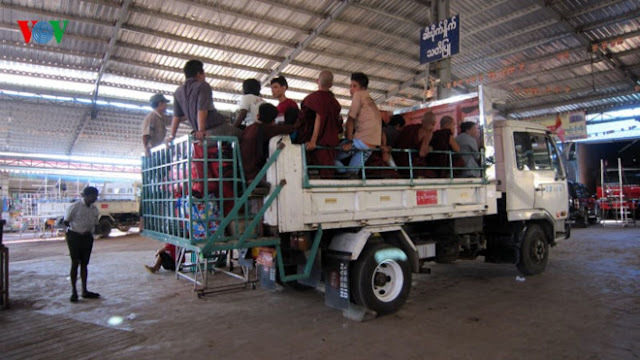 There are only two ways to visit the pagoda: pick up a semi-truck or walk through dense jungles from the bus station at Kimmunsakhan to Kinpun camp at the foot of Kyaikhtiyo. Sitting in the car with the sun and dust and breeze, the car sways when it climbs up the 11km-long winding slopes in about an hour as if participating in a thrilling game. To conquer mount Kyaiktiyo at the height of 1,100 m to Golden Rock Pagoda, from the foot of the mountain, visitors can only walk or rent a sedan carried by four young and healthy men. Sitting on the sedan, swinging in the pace of the pace, there are moments of relaxation watching the two sides of the road is also a unique experience. The rent is around $ 10 per person and about $ 4 extra for the carriers. Before entering the Gate, tourists, as well as the Buddhists, must take off footwear and leave outside the gate, then conquer a long distance to the pagoda.